Queen Elizabeth II has joined 2,000 guests for a service at Westminster Abbey to mark 60 years since her Coronation. Archbishop of Canterbury the Most Rev Justin Welby said the event honored “60 years of commitment”. The Queen was accompanied by more than 20 members of her family, including Prince Philip who pulled out of an engagement on Monday night because he was feeling unwell. The Queen and the Duke of Edinburgh entered Westminster Abbey to the same music that greeted her in 1953. Back in 1953, at the age of 27, she was the 38th sovereign to be crowned in an abbey that has been the scene of such ceremonies since the coronation of William the Conqueror in 1066. The Archbishop of Canterbury told those gathered in the abbey that the Coronation had been “an ordination, a setting aside of a person for service”. Dr. Justin Welby said that during the ceremony the Queen knelt at the abbey’s altar and prayed. “We do not know what was prayed. Her Majesty knelt at the beginning of a path of demanding devotion and utter self-sacrifice, a path she did not choose, yet to which she was called by God. At the time the Coronation was a major television spectacle, with an estimated 27 million Britons tuning in. The weather was dull and wet, but warm sunshine greeted those gathering in London for the anniversary on Tuesday. The Archbishop said the Coronation had been “the first time the whole nation had watched anything as it happened”. He called it “pomp and ceremony on a rainy June day, all so very British, wrapped in time and custom”. 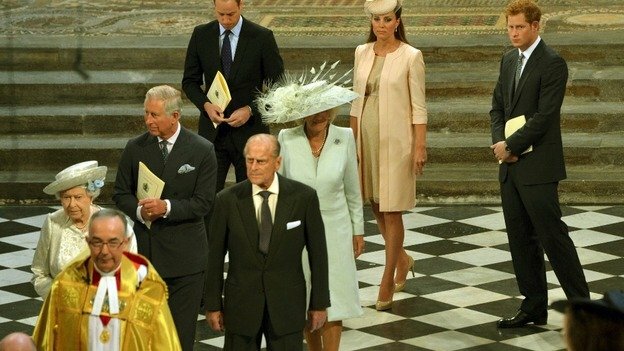 Her Majesty wore an Angela Kelly dress, hat and coat – made from oyster-colored silk-satin brocade – for the anniversary service. The Queen was joined at the abbey by the Prince of Wales – who was just four in 1953 – and the Duchess of Cornwall, as well as the Duke of Cambridge and the pregnant Kate Middleton. It is the first time Kate Middleton and Prince William, whose first baby is due next month, have attended a public event at the abbey since they married there two years ago. Other royals present include Prince Harry, the Duke of York, Princesses Beatrice and Eugenie, the Earl and Countess of Wessex, Lady Louise Windsor, the Princess Royal and Zara Phillips with her husband Mike Tindall. The congregation sang the National Anthem before UK Prime Minister David Cameron gave a reading from the Book of Kings. Secretary general of the Commonwealth Kamalesh Sharma also gave a reading. Actress Claire Skinner read a poem called The Throne, written for the anniversary by Poet Laureate Carol Ann Duffy. The Dean of Westminster, the Very Reverend John Hall, said the service marked “60 years of duty done with a glad heart”. Lady Glenconner was one of the Queen’s six maids of honor in 1953. She said: “I remember standing by the door… I remember a roar coming round, we could hear everybody shouting. Then suddenly around the corner came this amazing golden coach, it was like a fairy tale. The Queen, whose reign began in 1952, practiced wearing the crown around Buckingham Palace in the weeks before her Coronation, including at her children’s bath time. The Coronation was a strictly Anglican Christian event, but 60 years later Sikhism, Islam, Buddhism, Judaism and other faiths were represented. Last year’s Diamond Jubilee marked the 60th anniversary of the Queen’s accession to the throne. Prince Philip had been due to accompany the Queen to a gala reception for the Royal National Institute of Blind People (RNIB) at St James’s Palace in London on Monday but was unwell.